Ever since the dust settled on Ireland’s historic Grand Slam in 2009, the focus has shifted to the 2010 RBS Six Nations Championship, and much has been written. Since the 1st January 2010, the coverage has grown and numerous questions emerged: Would Ireland retain their title? Could France finally string together five consecutive world-class performances? Were England, under the guidance of Martin Johnson, making progress? Could Wales mount a serious challenge for the Championship? Was Andy Robinson any closer to helping Scotland make the next step? And would Italy, so often the whipping boys, claim any scalps? Three games into the Championship, having passed the half way stage, many of the questions above have been answered. France are unbeaten, and the have left the other nations trailing in their wake. But how have the media covered this year’s Championship? Which nation has enjoyed the most coverage? Has winning lead to more column inches? Or has defeat been covered in greater depth? Which players’ names are in lights, and why? O’Leary Analytics has conducted research into the media coverage of each team in this year’s Six Nations Championship and analysed how the media in each nation, and globally, is covering the event. **In the graphic above, Scotland is split into North and South (for the purpose of regional analysis), and the Black segment, labelled “United Kingdom”, refers to England only, as opposed to the entire UK. In the Championship to date, France have been the dominant side. However, proportionally, the English media have taken the greatest interest in this years Championship, as illustrated in the graph above. 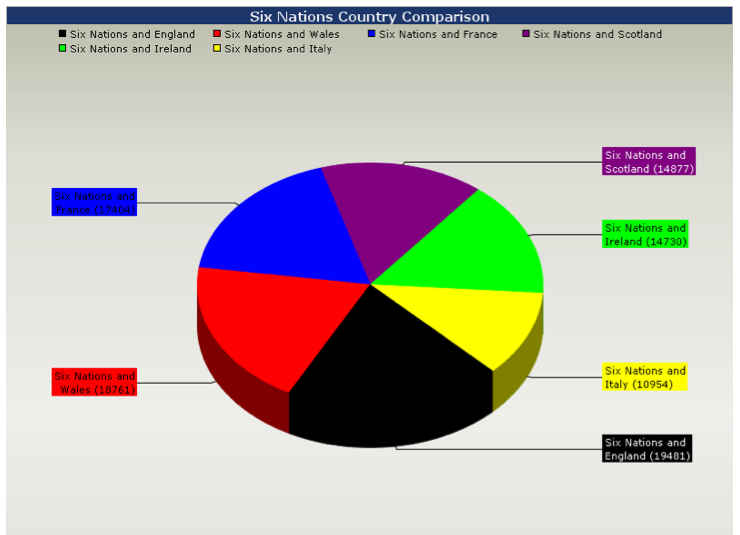 This Pie Chart reflects the coverage the term “6 Nations” (or “Six Nations” or “6-Nations”) has been given in the online media in each competing country. England dominate the media landscape with over 9,000 articles published since January 1st 2010, accounting for almost 50% of the total mentions among all competing nations. 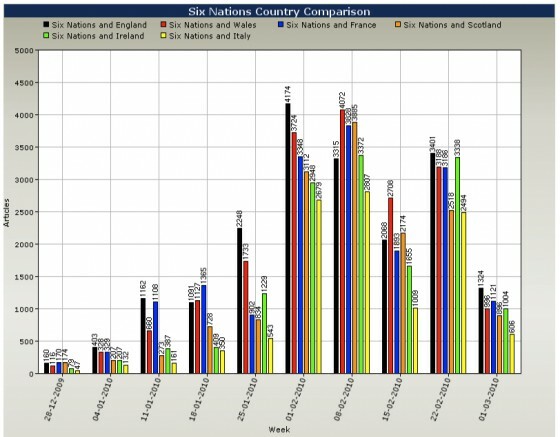 France come in second with 22% of the coverage, while Ireland, with proportionally far fewer online media publications, still managing to publish over 3,700 articles in a little over two months, or 19% of the total. Italy, Scotland and Wales collectively account for less than 15% of the total 6 Nations coverage. When the focus switches to a global basis, the balance changes significantly. The piechart above tells a very different story. 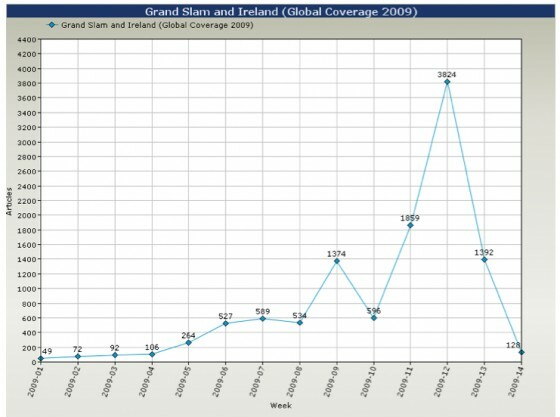 In this case, O’Leary Analytics have looked at the coverage each country has received globally, when mentioned in the same article as the Six Nations, in 2010. To ensure no relevant coverage was missed, the French and Italian translations were included as key search terms. For example, in the case of England, the search included any mention of “England” or “Angleterre” or “Inghilterra” together with “6 Nations” or “Six Nations” etc. The results show a major shift from how each country is reporting to how they are perceived on a global basis. Again, England lead the way with almost 20,000 articles published mentioning the nation in relation to the Championship since the start of the year. France, however, are shifted from second to third by Wales, while Ireland fall from third to fifth, with Scotland moving up to fourth. Italy, as in the first graph, remain at the bottom of the list. While it could be argued that this was a good sign for Wales, not all of the coverage was positive. During celebrations following their excellent comeback against Scotland in Round Two, Andy Powell was arrested for allegedly driving a golf cart down a motorway while drunk. As the chart below illustrates, the story garnered international coverage, with over 1,500 articles published in the 10 days of the incident. 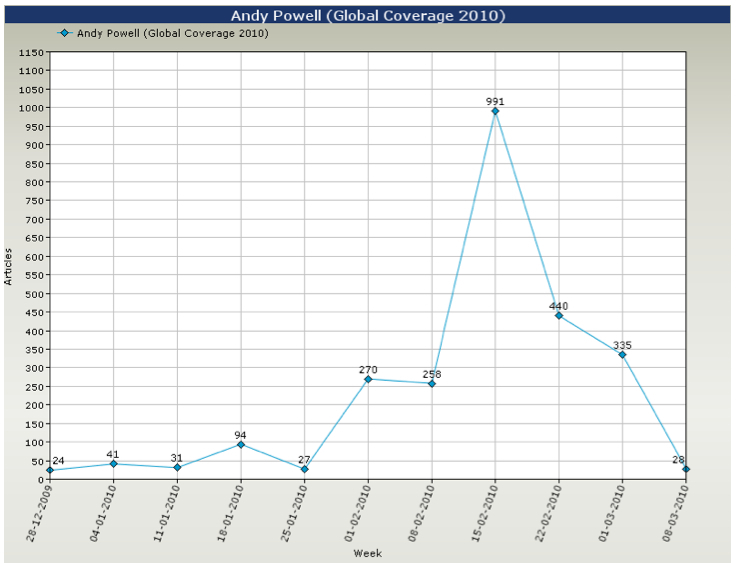 Each of the mentions above contributed to the total number of articles attributed to Wales in the graph above. If these 1,500 articles are subtracted, Wales slip from second place to third, behind France. When the coverage is broken down on a week by week basis, trends emerge in terms of winning and losing. Each team saw a significant increase in their coverage globally in the first week of the The RBS 6 Nations Championship. The upward trend continued following the second round of matches, except in the case of England. Despite winning against Italy in Rome, their performance wasn’t considered good enough, and perhaps the fall off in coverage was reflective of a nation losing interest in their national side after a lacklustre performance. 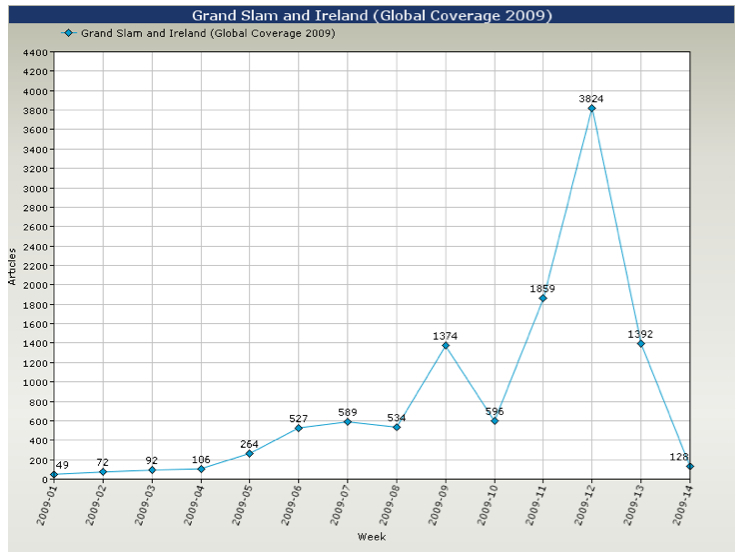 Ireland, by comparison, lost in Paris, and yet their coverage increased that week, with many commentators viewing the clash as a winner takes all event. During the rest period, coverage dipped again for all nations, but bounced back during the week of the third round of matches. Italy saw the biggest increase that week – a jump of almost 250% – helped in no small way by their excellent win against Scotland in Rome. 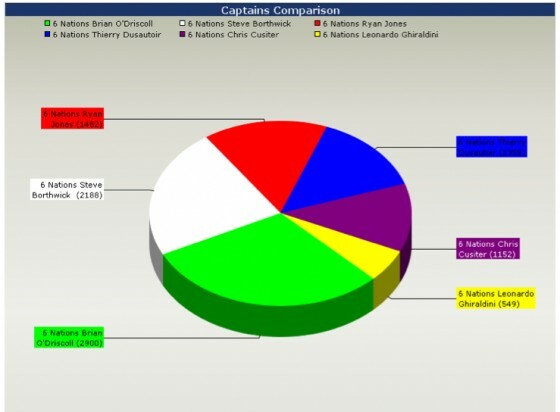 When the analysis is broken down by team captain, Brian O’Driscoll is the clear winner. The search criteria in this case are where the captains name, and “Six Nations” appear in the same article. O’Driscoll’s name has appeared in over 2,500 articles since the start of the year, globally, which is good news for his sponsors. Steve Borthwick ranks second in comparison, with Ryan Jones, Thierry Dusautoir, Chris Cusiter, and Leonardo Ghiraldini completing the lineup. RBS, as title sponsors of the Championship, has enjoyed a considerable amount of coverage. 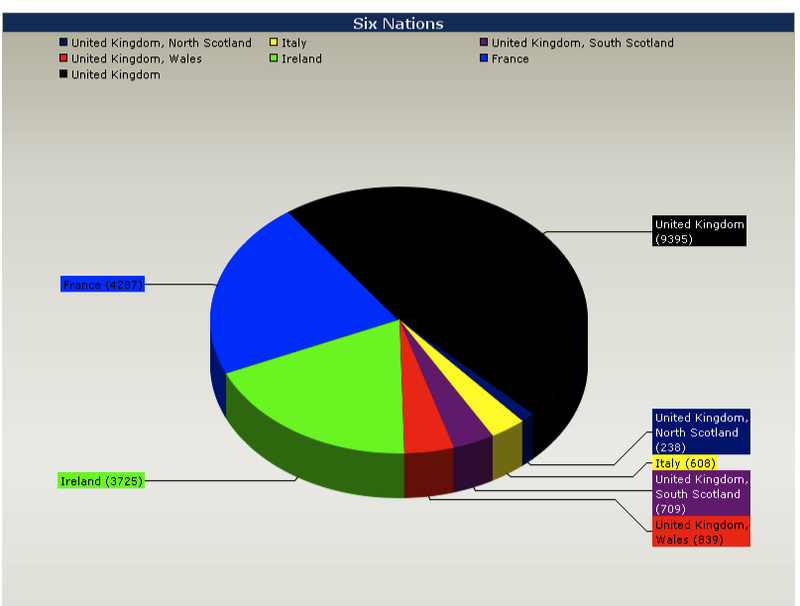 In the line graph below, mentions of “The RBS Six Nations” or “RBS 6 Nations” are compared with mentions of the “The Six Nations” or “6 Nations”. Out of a total of 19,903 articles mentioning the Six Nations, RBS featured in 10,560 – over 53%. 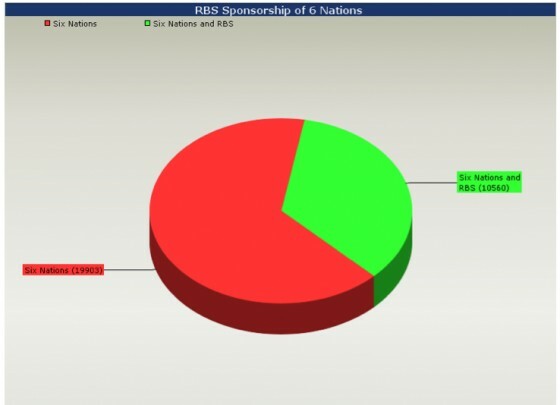 In over half of all the articles published mentioning the Six Nations Championships, RBS were named. This is an excellent return, and as the title sponsorship extends, it is a percentage that should increase. This weekend, Ireland face Wales at Croke Park with their eyes firmly fixed on a Triple Crown. Declan Kidney’s side bounced back from the disappointment of the loss to France with a hard-earned victory against England in Twickenham a few weeks ago. Italy, having scored a memorable victory against Scotland last week, face the daunting prospect of a trip to Paris to face a French side in fine form and with one hand on the Championship title. Meanwhile, England travel to Murrayfield, looking to put their defeat at the hands of Ireland behind them. Scotland, for their part, will be looking to reclaim the Calcutta Cup, and give their home fans something to cheer about following the loss to Italy in Rome last week. The results of these matches, and those the following weekend in the final round of the Championship will doubtless have an impact on the media coverage each nation receives. 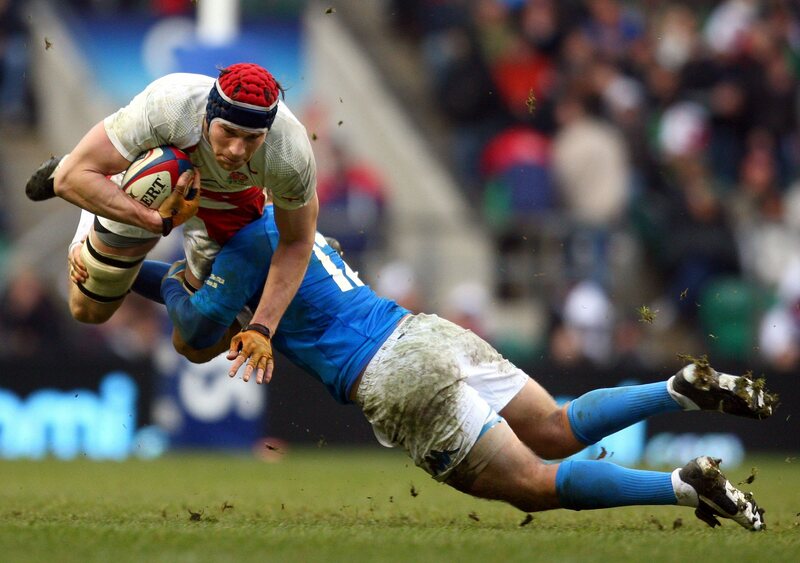 What may be of interest is to see whether France can go on and claim the Grand Slam. The media coverage of such a possibility has remained relatively low-key so far in 2010, but if they beat Italy in Paris this weekend, it sets up a fascinating clash with England for the Championship crown the following week. At this stage last year, Ireland were more than halfway to their historic Grand Slam. As the graph below illustrates, when momentum builds, so does the coverage – will we be looking at a similar trend for France in 2010? Check back in a few weeks for an update.